Readers of any prominent OU bloggers will probably have noticed that we appear to have something of Twitter culture developing within the organisation (e.g. “Twitter, microblogging and living in the stream“). After posting a few Thoughts on Visualising the OU Twitter Network…, I couldn’t resist the urge to have a go at drawing the OpenU twittergraph at the end of last week (although I had hoped someone else on the lazyweb might take up the challenge…) and posted a few teaser images (using broken code – oops) via twitter. Anyway, I tidied up the code a little, and managed to produce the following images, which I have to say are spectacularly uninteresting. The membership of the ‘OU twitter network’ was identified using a combination of searches on Twitter for “open.ac.uk” and “Open University”, coupled with personal knowledge. Which is to say, the membership list may well be incomplete. 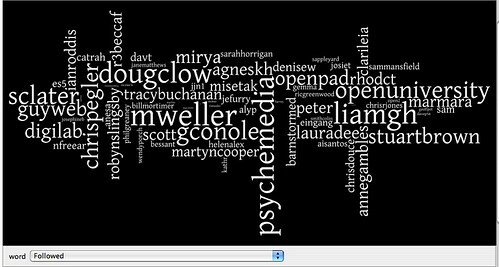 Wordle view showing who in the network has the most followers (the word size is proportional to the number of followers, so the bigger your name, the more people there are in the OU network that follow you). As Stuart predicted, this largely looks like a function of active time spent on Twitter. We can compare this with a Many Eyes tag cloud showing how widely people follow other members of the OU network (the word size is proportional to the number of people in the OU network that the named individual follows – so the bigger your name, the more people in the OU network you follow). So for example, who is Niall following/not following? 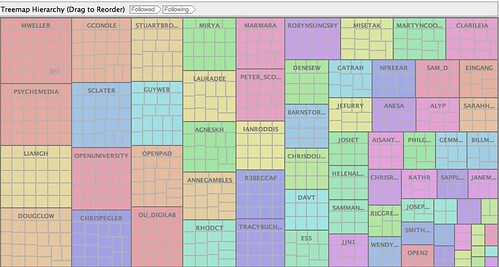 I’m not sure how useful a view of the OU Twittergraph is itself, though? 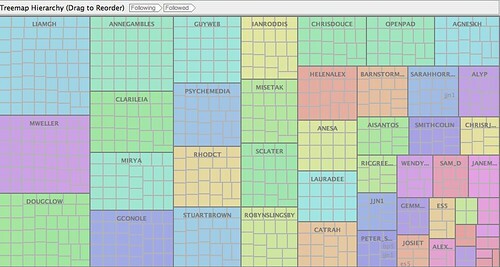 We can also compare the ‘active connectivity’ of several people in the OU Twitter network. For example, who is Martin talking to, (and who’s talking to Martin) compared with Niall’s conversations? As to why am I picking on Niall…? Well, apart from making the point that by engaging in ‘public’ social networks, other people can look at what you’re doing, it’s partly because thinking about this post on ‘Twitter impact factors’ kept me up all night: Twitter – how interconnected are you?. Very nice, but as you say, I’m not sure what it tells us, apart from who has most followers, which we probably knew. 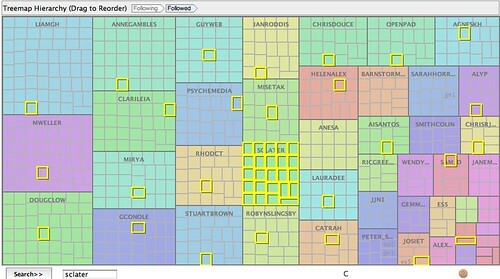 The search to see who follows who is nice, and the visualisation works well there. This isn’t a criticism, I think the same applies with lots of visualisation tools in social networks. 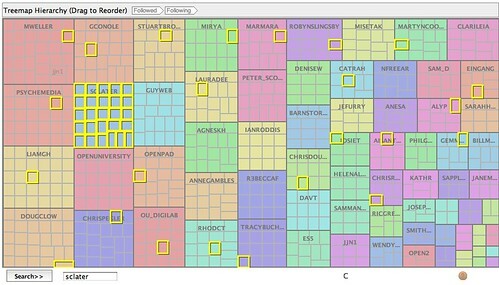 They either end up having too much data so you get a mess or not enough, so you get a league table. I’m sure there is something in there though. Like identifying types of users, or maybe mapping these interactions across institutional boundaries, ie to demonstrate the cross unit flow (do people communicate more with people in the same unit?). Jared Stein’s and John Krutsch’s tweetclouds was also quite useful in showing you who you communicated with the most. And of course all of this is only a proxy for the quality of your conversation, or your usefulness, value, etc. The network graph would maybe more interesting if I coloured the edges, for example to show whether people were ‘just’ following each other, following each other and sending each other messages one way (e.g. only ever from:@A to:@B) or were sending messages to each other (e.g. from:@A to:@B or from:@B to:@A)? This would show who was chatting to whom? But even then, this is just scrabbling at the surface of the graph making trivial (and largely uninteresting) ‘first order’ observations about it. My understanding of graphs is soooooooooooooo far from being able to pull out real insight or value from the twitter network (yet???) – but I want to start getting my head round what’s possible if we are going to exploit social learn data in any way at all? If I can get out of the totally unproductive context thrashing I’m stuck in at the moment, clear my course writing obligations and get out of doing quite so many presentations, then I intend to start getting to grips with the elementary graph theory/discrete mathematics and start seeing if I can pull useful stuff out of whatever network’n’graph data I can find. But then, if it was that important/interesting, other people would be doing it… So maybe it is all just a wild goose chase…? Oh, I know – what you’re doing here is thinking in public, and by doing that setting the rest of us off. I think you’re right – this is only scratching the surface – I’m sure there is really some great stuff to be mined from all this, but I just don’t know what it is yet. We need a data analysis research assistant. So about 50 of us are tweeting away. But we seem to be in pockets within the OU. Lots in IET and the library, for example, but is there much twittering going on in arts, social sciences or estates? Is everyone based in MK (not living there, but based there) or are lots of people involved from different regions? Maybe we need to move on from doing IET coffee mornings about Twitter, and start doing refectory coffee mornings about Twitter, or regional coffee mornings about Twitter? It’s a lot more difficult, R3becca, to figure out where people are based automatically just based on their Twitter bios. We could probably compile a list using the knowledge of some of the more connected and active Twitterers. If we’re going to do that, we might as well collect their faculty/affiliation data at the same time. On the plus side, this would be easy to do via Google forms or even via Twitter. It’s just a matter of someone having the time and energy to collect the data, and then to codify it so it can be used. i haven’t been a member in twitter yet, very interesting point of view indeed. Bit surprised I don’t seem to be on the diagrams or lists :) Can’t spot how the list of folk was determined – is it people who follow PlanetOU? Interesting question how you know if somebody is OU or not! Thinking about this a little bit more, it might be useful to also record how active each twitterer is, eg allowing us to display eg total number of updates, or maybe more usefully, the total number of updates over the last week? Previous Previous post: Google Personal Custom Search Engines?